If your little ones are fans of Nick Jr you may have already noticed Nick Jr's Sing-Along Summer. From the 17th July between 10am and 1pm all your child's favourite Nick Jr shows have been putting the lyrics to all their songs and theme tunes on screen for your child to sing along from home. Waterfields Retail Park, Watford, 27th July. This summer also sees the introduction of the new Dora and Friends toy range by Fisher-Price. We were lucky enough to test a few items from this new range! 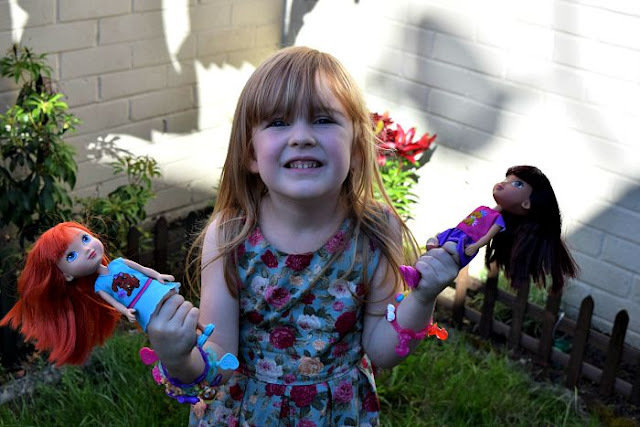 A play pack containing one small Dora doll along with a charm bracelet and three special charms for your child to wear. The charms included are Perrito (the dog), a camera and Dora's backpack. This is a great little set which Gracie loves. 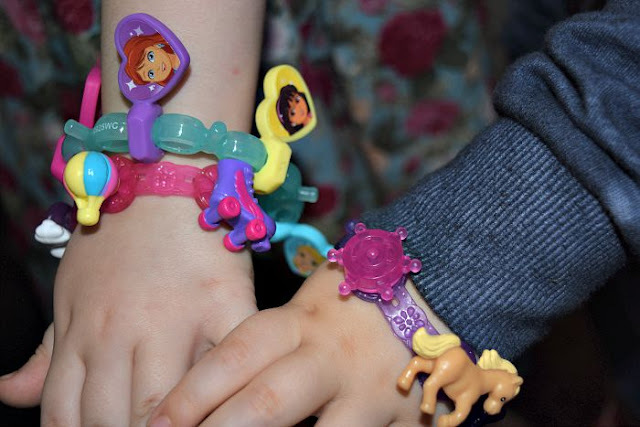 They are well made considering what children's jewellery is usually like and the charms are interchangeable for use with the Magic Charms Bracelet set. The magic charms bracelet comes with charms showing Dora and her best friends- Alana, Kate, Emma and Naiya. It has room inbetween for the adventure charms. Also as everything is better when shared with friends, the set also contains two more charm bracelets (like in the magic adventure charms set) and six adventure charms which are perfect to share with friends. Gracie has been sharing her charm bracelets with Zach, as you can see in the photograph above, and sharing the charms between them. You get a lot for your money in this set, I think it would make a great gift for a child's birthday. Something they could play with over and over. This Dora smartphone is just like the phone Dora uses in the television show. The screen can be pressed to make different sounds . 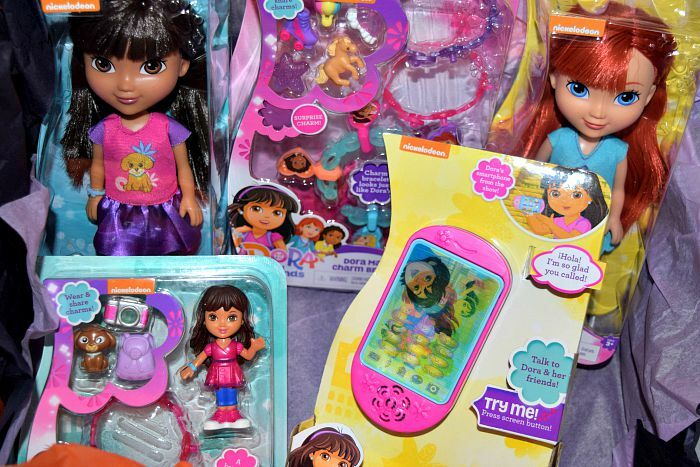 Your child can receive incoming calls and voicemails from Dora & friends. This was the most popular with the kids out of the toys we received. Both Gracie and Zach love it and have been caught having conversations and pretending to take pictures on it. It is just a basic toy smartphone with a simple button press but the kids are impressed and it would be worth buying if your child is a big Dora & Friends fan. These dolls are lovely. They are 8 inches tall so perfect for little hands and each comes dressed in an outfit inspired by the television series featuring soft hair and poseable arms and legs. Each doll comes with their own adventure charm to add to the adventure charm bracelets. We received Dora and Kate. 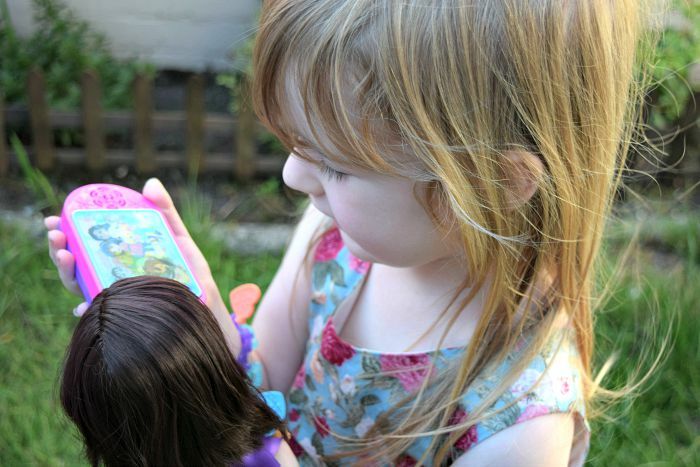 Gracie loves the Dora doll and Zach loves the Kate doll so they have been playing lovely together with them both. The dolls are lovely quality and I love the extra addition of the charms for the bracelets. A lovely range of toys and all great quality, not that I would expect any less from Fisher Price. The range will be available to buy from Smyths Toy Stores. Don't forget to tune in to Nick Jr every day from 10am-1pm to sing along with your favourite shows! Also on Monday 27th July between 11am-12pm if you head over to Twitter you can join in with the Dora Sing Along Twitter Frenzy. There will be lots of opportunities to win fab prizes so keep an eye on the #DoraSingAlong and tweet along using the hashtag for your chance to win.